If you’re reading this you probably believe the Panasonic ES8243A Arc4 is worth researching, but is it worth buying? Electric shavers are no longer the single blade-and-foil workhorses of my father’s generation. They’re advanced, highly technical pieces of engineering. So, when you’re hunting for a new shaver, there isn’t just one question you need answered. You want to know a lot about these shavers. 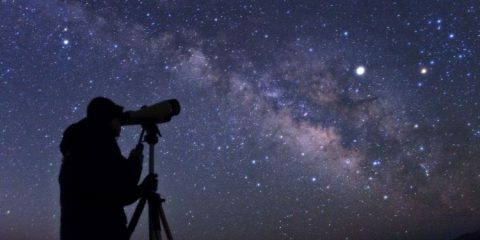 Although they specialize in one thing, many elements combine to make it happen. 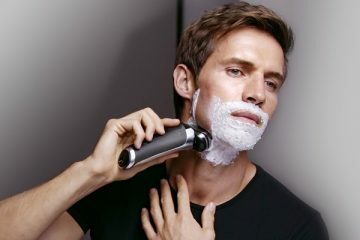 In this ES8243A Arc4 review, I break down what you need to know so you can make an informed purchase, from features to real shaving performance. Will the Arc4 be your next electric razor? Let’s find out. What Sets the Panasonic ES8243A Arc4 Apart from its Competition? The “4” in Arc4 comes from its 4 foil elements: three micro-thin mesh foils and one guide comb. The 3 foils lift hair that grows parallel with your skin. And the guide comb directs longer hairs that may otherwise miss the foils. The Japanese forged blades are ultra-sharp and hypoallergenic. They’re stainless steel and designed to clean up easily after a wet or a dry shave. 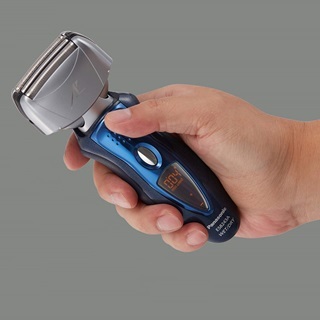 Your average electronic shaver has a 10,000 CPM (cuts per minute) motor. Panasonic boosted the Arc4’s motor to 13,000 CPM. So, with every pass you get 1.5x the performance. In practice, you’ll find the Arc4 performs well. The only downside is that it’s louder than a few other shavers I’ve tested. Not much louder, but it’s noticeable. The waterproof body and Japanese stainless-steel blades mean you can use this shaver in several ways. The Arc4 is fully capable of wet or dry shaving. Plus, you can apply shaving gels, creams, or special electric shaver lotions with no decrease in performance. Panasonic forges its blades and foils at 30 degrees. The result is a noticeable curve to their cutting elements. 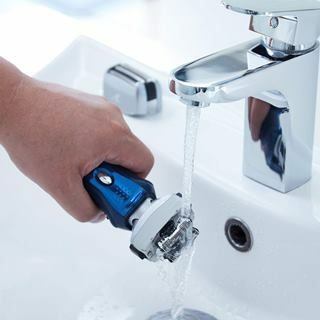 No other manufacturer does this with their shavers. The curved shaving head contours to skin much better than a straight foil. More skin touching the foil means the shaver cuts more hairs with each pass. The Arc4’s front-facing LCD display provides a wealth of information. You’ll find the basics like low battery and battery charge indicator. But there are some interesting additions, too. You get a cleaning and blade swap reminder. And the handy shave timer tracks how long you take to shave. How Does the Arc4 Feel to Hold? Initially, the Arc4’s weight concerned me. It’s lighter than most shavers I’ve tested. 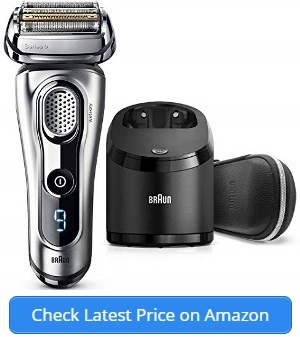 For example, it’s three times lighter than a comparable Braun shaver. But the build quality allayed my initial concerns. The rubberized grips on the side and back of the shaver keep it snug in my hand. And when I turned on the device, I was impressed by the motor’s above average power. The waterproof chassis is comfortable to hold in the shower. The power button is at a perfect thumb level. You can turn it on and off without a problem. There’s a lock on the back to hold the pivoting shaver head in place. I assume you use that when traveling or if you want to shave old-school style. My only gripe is the wide shaver head. Those 4 foils take up a lot of space. But as I mention later, you quickly adapt. Plus, the wide head means you make fewer passes. Panasonic’s copy states that the battery lasts you about 45 minutes. I shave every other day for five minutes. That’s about nine days of shaving per charge. I found my day-to-day results varied. But on average I charged the shaver every seven to eight days. Either way, the Arc4 can easily last you a week. Even if you run out of charge mid-shave, it’s not a problem. Because the shaver comes installed with a quick-charge function. After five minutes you’ll have enough juice for an entire shave. Panasonic installs a lithium ion battery in the Arc4 shaver. Unlike the older Ni-Cad batteries, lithium ion doesn’t degrade. It also doesn’t lose power when it nears depletion. Half battery or a quarter battery, the Arc4 will perform like it was full. How Well Does the Arc4 Shave? Because the Arc4 is a dry and wet shaver, I tested both under similar conditions. I shaved dry at the bathroom sink with two-day stubble. Then I shaved two days later using shaving lather. I consider my facial hair to be about average. Take that into account if you have thicker facial hair. When I turned on the Arc 4 and brought it to my face, I noticed the size of the shaver head immediately. Most foil shavers I review are 2 or 3 foil systems. You’d think the addition of one more foil wouldn’t change that much. It does. Maneuvering around my cheeks and jaw line proved easy. I found the trickiest spots to shave were under my nose and near my sideburns. But I quickly adjusted to the shaver’s size. By the time I was halfway done, the wide 4-foil head seemed no different than any other shaver. The strong motor went through my beard without a problem. Considering how lightweight the device is, it impressed me. The shave ended quicker than I expected. I did two full passes and found the Arc4 cut most of my hair on the first pass. The result? A smooth, near-razor close shave. I rarely wet shave with an electric razor. 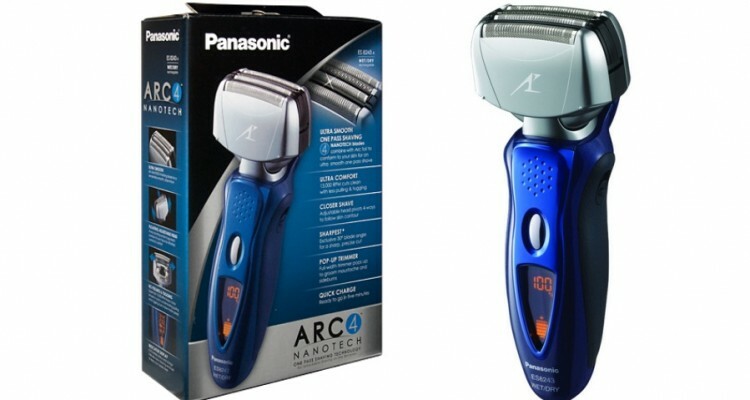 But the Panasonic Arc4 cured my wet shave issues. Honestly, I was shocked how easily the electric razor performed with shaving gel. I’ve tried wet shaving with the Arc3 device, and I wasn’t hooked. Because of the larger head design of the Arc4, wet shaving works much better. It’s a flawless experience. The spent lather on your face doesn’t obstruct the blades. I didn’t need to stop and clean out the shaver half way through like some other brands. Overall, dry and wet shaving performed equally. Like I mentioned before, the biggest issue with the Arc4 is also a positive: the larger than average shaver head. True, it’s annoying getting it into those tighter spots, but not impossible. 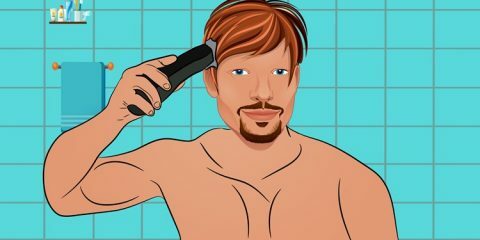 And the positive of the large shaver head is you require fewer overall passes with the shaver. The ES8243A Arc4 impressed me. Having tested both its dry and wet capabilities, I consider it an above average shaver. It’s right up there with premium models. Is Maintaining the Panasonic ES8243A Arc4 Difficult? A badly maintained electric razor won’t last nearly as long as a properly cared for shaver. Trust me. I speak from experience. I’ve misused many shavers, and I’ve learned my lesson. Nowadays I take care of every shaver I use. And the Arc4 is one of the easiest to maintain that I’ve used in a long time. All you do is disengage the two buttons on the sides of the shaver head and the foil top pops off. You can clean the 4-foil top under running water or tap it out into your sink. The cutting blades themselves are stainless steel. Running them exposed under warm water won’t rust them. I dunk the blades and set the shaver to sonic vibration cleaning mode. The shaver does the rest. There’s no need to brush out the blades or foils. Because the foils are so thin, I recommend you let nothing touch them except your face. The Arc4 will also tell you when to replace the blades and foils. Around the 18-month point the indicator will light up on your LCD display. Removing the blades is a simple process. You press down on each individual blade and it pops off. Properly maintained, I imagine this well-made shaver could last you years. I found the 4-foil system reduced the amount of passes I made, resulting in a shorter shave. My end result was a smooth, long lasting shave that neared the closeness of a razor. 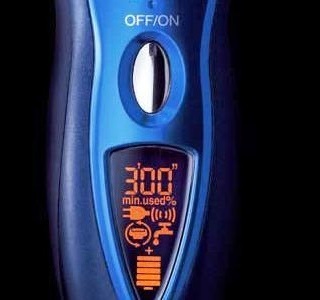 The informative LCD display kept me abreast on every aspect of the shaver, from battery life to maintenance. I breezed through wet shaving with this shaver and the clean up was easy. The shaver includes a good travel case that protects the shaver means I travel stress-free. Dead simple weekly maintenance and the sonic vibration mode works better than I expected. Weighing in at only 6.2oz, the Arc4 strikes a balance between durability and performance. The 13,000 CPM motor more than adequately cuts even thick or dense facial hair. Although it provides a close shave, expect to adjust to the larger-than-average 4-foil head. I’m not a fan of Panasonic’s horizontal pop-up trimmer. But it touches up your sideburns and mustache well. We live in a complicated world. Hopefully, I’ve made this task of yours a little less complicated. If you’re mulling over the decision to buy an Arc4, I recommend you do it. And if you’re deciding between a few contenders, you won’t feel gypped buying the Arc4. Few shavers are the whole package. They advertise features that don’t quite come together. But the Panasonic ES8243A Arc4 mixes just enough tech and engineering to provide a satisfying product. With the proper maintenance and care, I can see this shaver lasting you years. Easily. And what’s a better deal than that? I don’t know what sort of new technology the future holds for electric razors. But until that day arrives, I recommend you stick with the Arc4. 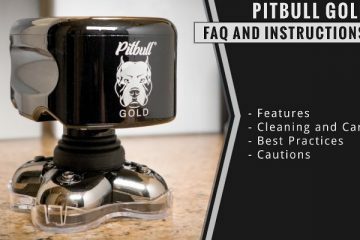 Pitbull Gold Shaver: Is It a Good Choice for Head Shaving?